Sometimes it is just possible get the feel for a city even when on a business trip. Heathrow to Madrid is delayed by an hour – something that seems to happen a fair bit with short-haul European flights. Madrid airport is absolutely vast and has a remote satellite. Some gates take an ominous 23 minutes to reach from security. It’s a 30-minute and 35-40 Euro cab ride into town. I am staying at the Westin Palace on Plaza de las Cortes – a large hotel with an impressive mutli-coloured glass ceiling dome under which you can eat or have a drink. Dinner that evening involves a short stroll to Plaza de Santa Ana, where Vinoteca provides excellent outdoor tapas against a backdrop of classic high Spanish facades. In the morning I have free time. My main target is the Museo Reina Sofia, home of Picasso’s famous Guernicamural depicting the plight of the Spanish Civil War. Infuriatingly, it shuts on Tuesdays – the only free slot I have. On reflection this was probably just as well, since the collection also includes Dali’s The Great Masturbator. 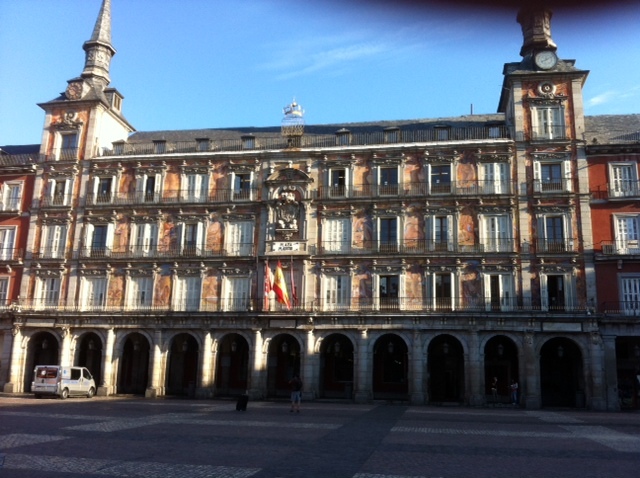 Instead I opt for a pleasant stroll through the backstreets to Plaza Mayor, a suitable venue for a coffee whilst watching the restaurants set up for the day. 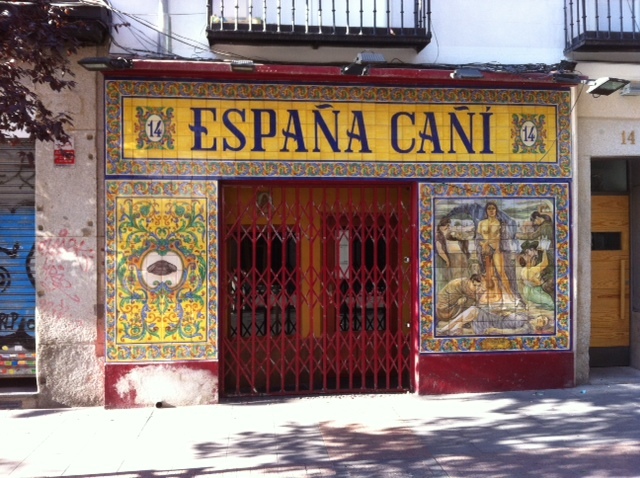 Rambling further through Calle de las Huertas brings you across to the Paseo del Prado and the famous museum. I go to the other great museum in town – the Thyssen-Bornemisza, currently hosting a Pissarro collection which was a rather samey gathering of endless rural scenes. After putting some work in during the afternoon, we all troop off to Hotel ADA Palace, squeezing into a tiny three-man lift to emerge on the rooftop at the seventh floor. The views from here are spectacular as we tuck into fantastically interesting (and massive) gin and tonics offset by orange zest and chilli. The weather changes as we drink, from sunny to city lighting up, dramatic sunset, and then near-rainy as a storm moves in. Dinner is superb high-class tapas at Los Gallos in Calle Puigcerda, with excellent wines and delicious steak to round off. After another day’s work – during which it tips down most of the time – it’s back to the airport. On observing a massive pile-up involving two jack-knifed lorries in the opposite lane, my cab driver embarks on a series of ill-advised texts while traveling at 100km an hour. I did of course live to tell the tale. 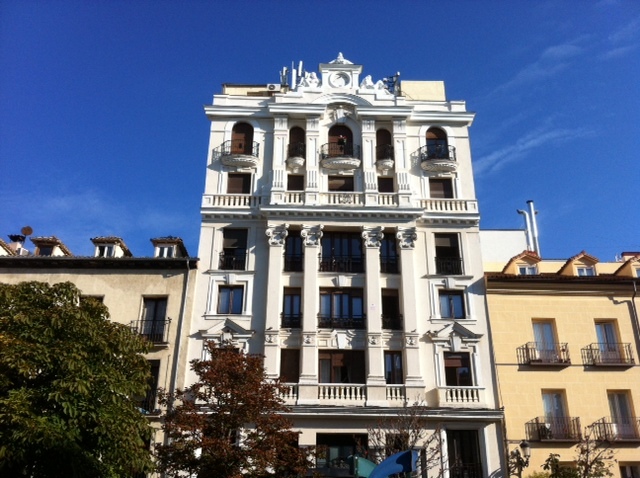 Madrid is a fine bustling city. It offers more in character and atmosphere than in topography (it’s in a featureless plain), and landmarks (there’s not much beyond the museums and churches).